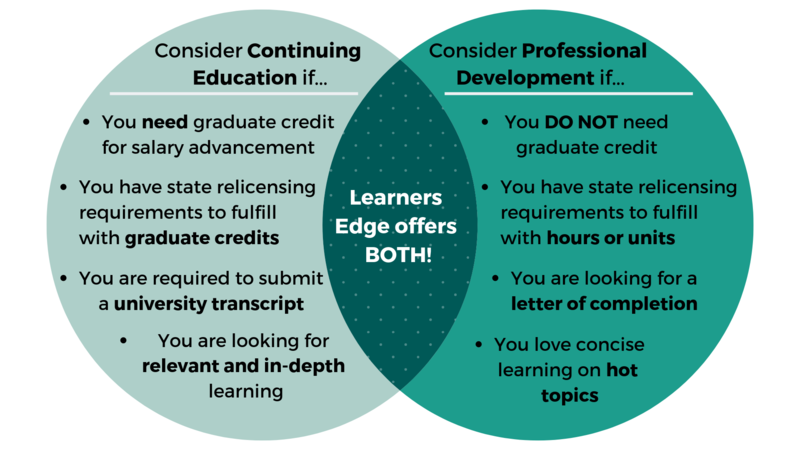 Below is a summary of how Learners Edge may help your continuing education and Tennessee teaching license renewal needs. This summary should in no way release individuals from their responsibility of ensuring that the course they take meets their professional needs. We hope it provides assistance in understanding how Learners Edge might help you in the accumulation of clock hours or graduate credit for salary advancement and the Tennessee teaching relicensure process. See the Tennessee Department of Education website for complete TN teacher relicensure information. The Practitioner License is valid for three years. If an educator does not meet expectations for advancement to the Professional License, the Practitioner License may be renewed once. The Professional License is valid for six years. In order to renew the Professional License, educators must earn 60 Professional Development Points (PDPs). Please note, Learners Edge courses are approved and offered for graduate credit by our regionally accredited and state approved college/university partners. Continuing education graduate credit is intended to fulfill requirements for license renewal/lane change when the student has obtained proper prior approval.